About Backup: In Windows, users have provision for backup creation (using NTBackup). Using this, they can take backups of their crucial files and can store them safely. The backup files are stored with .bkf extension and in MTF file format. In this Windows file backup utility, there is 'archive bit' which help users to find the files stored in previous backup. This information of the archive bit changes every time a complete backup is performed by the file backup program. During backup data process, with the help of your data backup utility tool, there can be an accidental deletion of the archive bit information. If you select backup file for restoration and go to 'Advanced' properties, then you can see the checkbox "File is ready for archiving" is not checked. 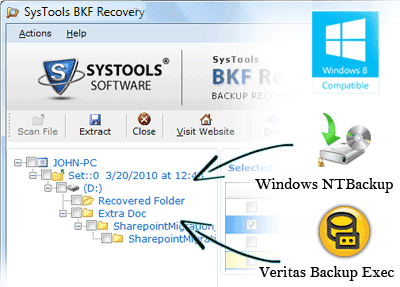 After your archive bit gets deleted, you will not be able to restore data from the BKF files by using NTBackup.exe. The reason behind the occurrence of this situation is the selection of 'Verify data after backup completes' under the 'Options' dialog box. How to Cope Up With a Situation? To get rid of such a situation, you should first of all stop selecting the option of 'Verify data after backup completes' under the 'Options' dialog box. How to Fix Destroyed BKF File after Corruption? If archive bit get corrupted/ damaged, it will create trouble for you. To eradicate the trouble, you need to take help from some proficient third-party tool; using which, you can repair corrupted/damaged BKF files. You can use BKF Repair tool, which employs fast and high-end algorithms for scanning the files and Repair MS Backup. This is an advanced software and highly reliable tool for backup data recovery. Using this BKF Repair tool, you can get rid of archive bit problem in Vista file or Windows XP file. BKF Repair is simple and intuitive tool to solve your purpose rapidly and competently.